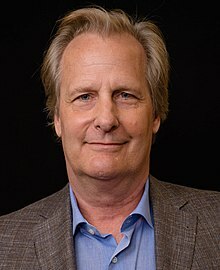 For other people named Jeff Daniels, see Jeff Daniels (disambiguation). Not to be confused with Jeffrey Daniel. Jeffrey Warren Daniels (born February 19, 1955) is an American actor, musician, and playwright whose career includes roles in films, stage productions, and on television, for which he has won two Emmy Awards and received Golden Globe, Screen Actors Guild and Tony Award nominations. Making his film debut in Ragtime (1981), Daniels's film credits include Terms of Endearment (1983), Arachnophobia (1990), Gettysburg (1993), Speed (1994), 101 Dalmatians (1996), Fly Away Home (1996), Pleasantville (1998), The Hours (2002), Gods and Generals (2003), Good Night, and Good Luck (2005), Infamous (2006), The Lookout (2007), Looper (2012), Steve Jobs (2015), and The Martian (2015). Daniels is also known for playing Harry Dunne in the buddy comedy Dumb and Dumber (1994) and its sequel Dumb and Dumber To (2014). He received Golden Globe Award nominations for Best Actor, for his performances in The Purple Rose of Cairo (1985), Something Wild (1986), and The Squid and the Whale (2005). Daniels has received a number of award nominations for his work on stage, including Tony Award nominations for Best Actor for his roles in the plays God of Carnage and Blackbird. He is the founder and current executive director of the Chelsea, Michigan–based Purple Rose Theatre Company. From 2012 to 2014 Daniels starred as Will McAvoy in the HBO political drama series The Newsroom, for which he won the 2013 Primetime Emmy Award for Outstanding Lead Actor in a Drama Series and received Golden Globe and Screen Actors Guild Award nominations. He won a second Primetime Emmy Award in 2018 for his supporting performance in the Netflix miniseries Godless (2017), receiving an additional nomination that year for his leading performance as John P. O'Neill in the Hulu miniseries The Looming Tower (2018). Daniels was born in Clarke County, Georgia, to Marjorie J. (née Ferguson) and Robert Lee "Bob" Daniels. He spent the first six weeks of his life in Georgia, where his father was then teaching, and grew up in Chelsea, Michigan. His father owned the Chelsea Lumber Company and was also a onetime mayor of Chelsea. Daniels was raised Methodist. He attended Central Michigan University and participated in the school's theater program. In the summer of 1976, he attended the Eastern Michigan University drama school to participate in a special Bicentennial Repertory program, where he performed in The Hot l Baltimore and three other plays performed in repertoire. Marshall W. Mason was the guest director at EMU, and he invited Jeff to come to New York to work at the Circle Repertory Theatre, where he performed in Fifth of July by Lanford Wilson in the 1977–78 season. Daniels performed in New York in The Shortchanged Review (1979) at Second Stage Theatre. It was the first show of the inaugural season for Second Stage Theatre. Daniels has starred in a number of New York productions, on and off Broadway. On Broadway, he has appeared in Lanford Wilson's Redwood Curtain, A. R. Gurney's The Golden Age, and Wilson's Fifth of July, for which he was nominated for a Drama Desk Award for Best Supporting Actor. Off-Broadway, he received a Drama Desk nomination for Wilson's Lemon Sky and an Obie Award for his performance in the Circle Repertory Company production of Johnny Got His Gun. In 2009, he received a nomination for the Tony Award for Best Actor in a Play for his performance in God of Carnage, opposite Hope Davis, James Gandolfini, and Marcia Gay Harden. In 2016 he received a nomination for the Tony Award for Best Actor in a Play for his performance in Blackbird, opposite Michelle Williams. In December 2018, Daniels began performing in To Kill a Mockingbird on Broadway at the Shubert Theatre. Daniels made his screen debut in Miloš Forman's Ragtime in 1981. His next film, the Academy Award-winning Terms of Endearment, in which he played Debra Winger's callow and unfaithful husband, was his breakthrough. In 1985, Daniels starred in Woody Allen's The Purple Rose Of Cairo alongside Mia Farrow and Danny Aiello. The film was met with critical praise earning a 91% on Rotten Tomatoes with the consensus reading, "lighthearted and sweet, Purple Rose stands as one of Woody Allen's more inventive -- and enchantingly whimsical -- pictures." Daniels garnered a Golden Globe nomination for his performance It was the film that inspired the name for the theater company he established. In 1986, he starred in Jonathan Demme's Something Wild as an unassuming businessman swept up into a wild night by a mysterious woman (Melanie Griffith) and earned his second Golden Globe nomination. In 1990, Daniels starred in two films (Love Hurts and The Butcher's Wife). His next notable role was as Colonel Joshua Chamberlain in Gettysburg. Daniels reprised the role of Chamberlain 10 years later in the prequel film Gods and Generals. In 1994 Daniels would co-star with Jim Carrey in one of his most commercially successful films, Dumb and Dumber. It was a noted departure for Daniels, owing to his status as a dramatic actor. That same year Daniels appeared with Keanu Reeves in the action blockbuster Speed; the film was an enormous hit, grossing over $350 million at the box office. Daniels would then host Saturday Night Live a second time before the release of the 1996 Disney live-action remake of 101 Dalmatians. Daniels starred as the owner of a litter of dalmatians stolen by the evil Cruella De Vil (Glenn Close). The film was successful, grossing $320 million. Also in 1996 was the family hit film Fly Away Home with Daniels as the supportive single father of Anna Paquin's goose-raising preteen. Daniels then had a critical and commercial misfire with Trial and Error (1997). He would rebound, however, with 1998's Pleasantville as diner owner Bill Johnson, who learns to act as an individual and rebel against the norm at the urging of Tobey Maguire's David. Also starring Reese Witherspoon, Joan Allen, and Don Knotts, Pleasantville was nominated for three Academy Awards. Daniels starred alongside Christopher Lloyd in the critically and commercially unsuccessful film, My Favorite Martian. Daniels starred in the TV films The Crossing, Cheaters, and the direct-to-video release Chasing Sleep. At this point, in the early 2000s, he began to focus more on his theater work at The Purple Rose Theatre as well as writing, starring, and directing the films Escanaba in da Moonlight and Super Sucker. Daniels's next major film role would be in Clint Eastwood's Blood Work, which received mixed reviews and was a commercial failure. He would rebound later that year with Stephen Daldry's Academy Award–winning The Hours alongside Meryl Streep, Julianne Moore and Nicole Kidman. The film was also a financial success, grossing well over $100 million. Gods and Generals followed in 2003, as did the action film I Witness, which co-starred James Spader. Daniels then starred in Imaginary Heroes and the 2004 television film adaptation of fellow Michigander and friend Mitch Albom's bestseller The Five People You Meet in Heaven. The year 2005 proved to be a strong year for Daniels as he garnered notice as the star of the lauded Noah Baumbach film The Squid and the Whale with Laura Linney. Daniels received his third Golden Globe nomination for the film, about a divorcing couple and the effect the split has on their children. That year Daniels also starred in the family film adaptation of Because of Winn-Dixie. He would round out the year with a supporting role in George Clooney's Oscar-nominated film Good Night and Good Luck, starring David Straithairn, Patricia Clarkson, Robert Downey Jr., and Frank Langella. In 2006, Daniels appeared in the Truman Capote biopic Infamous starring Toby Jones, Sandra Bullock, Gwyneth Paltrow and Sigourney Weaver. The film was compared to Bennett Miller's 2005 film Capote starring Philip Seymour Hoffman, Catherine Keener and Chris Cooper. Daniels then starred in Barry Sonnenfeld's family film RV, alongside Robin Williams as the redneck comic foil to Williams' uptight business man. He also starred in two other independent films, Mama's Boy and The Lookout, for which he was nominated for a Satellite Award. He then took back-to-back supporting roles in political thrillers: Traitor with Don Cheadle and State of Play with Russell Crowe and Rachel McAdams. Also in 2009, Daniels would appear in the indie hit Away We Go. 2010 would be a slow year for Daniels. He continued his theater work and had a starring role in the little-seen indie Howl, alongside James Franco as Allen Ginsberg. In 2012 Daniels became the new announcing voice for Apple with the iPhone 5 ads. Daniels starred in the Aaron Sorkin's HBO drama series The Newsroom (2012-2014) as fictional news anchor Will McAvoy, winning a Primetime Emmy Award for the first season. The opening scene in which Daniels gives a monologue on the state of American greatness has been viewed more than 13 million times on YouTube. The series also starred Emily Mortimer, Sam Waterston, Olivia Munn, Allison Pill, and Jane Fonda. In 2015, Daniels reunited with Sorkin in the biographical drama film Steve Jobs with Michael Fassbender, and Kate Winslet. He portrayed CEO John Sculley. The film was directed by Academy Award winner Danny Boyle, and written by Academy Award winner Aaron Sorkin. The film was a critical success earning an 86% on Rotten Tomatoes with the consensus reading, "Like the tech giant co-founded by its subject, Steve Jobs gathers brilliant people to deliver a product whose elegance belies the intricate complexities at its core." Sorkin won the Golden Globe for its Screenplay. He played David in The Divergent Series: Allegiant and was set to reprise the role in the planned The Divergent Series: Ascendant. In 2014 he reprised his role as Harry Dunne in Dumb and Dumber To. In 2017 Daniels portrayed the villain Frank Griffin in the Netflix original series Godless, winning his second Primetime Emmy Award. Daniels was featured on the cover of the April–May 2011 issue of Guitar Aficionado magazine as well as the July–August 2011 issue of Making Music, where he discussed his experiences with music. Daniels has appeared as the TV spokesman for the Michigan Economic Development Corporation, promoting Michigan's effectiveness in bringing in new companies, featured on CNBC. He was inducted into the Michigan Walk of Fame on May 25, 2006, in Lansing, Michigan, and delivered the winter commencement address at the University of Michigan on December 20, 2009, at which he was granted an Honorary Doctorate in Fine Arts. The Purple Rose Theatre Company (or PRTC) was founded by Daniels in 1991. Originally known as the Garage Theatre, The Rose takes its name from Woody Allen's 1985 film The Purple Rose of Cairo, which starred Daniels and Mia Farrow. The theatre provides resources for training actors, playwrights, and other theatre artists residing in the Midwest and develops new plays based on life in the Great Lakes Basin. The main performance space and administrative offices occupy a building in Chelsea, Michigan, once owned by Daniels' grandfather. The theatre produces four shows a year on a 3/4 thrust stage in a 168-seat house. The PRTC is a 501(c)3 not-for-profit organization and operates under a Small Professional Theatre (SPT) Agreement with the Actors' Equity Association (AEA). The Purple Rose offers a year-long apprenticeship program for young artists entering a career in theatre. Apprentices are paid a modest stipend and work as many as 80 hours per week gaining experience in lighting, sound, stage management, design, set construction, and administrative/box office work. The seven apprentices also maintain and clean the theatre's facilities. The program was inspired by Daniels' experience as an apprentice with the Circle Repertory Company in New York City. ^ "Robert Lee Daniels obituary". Obits.mlive.com. Retrieved January 26, 2013. ^ Lai, Daniel (September 1, 2012). "Bob Daniels, Chelsea Lumber Owner, Dies at Age 83". Chelsea.patch.com. Retrieved January 26, 2013. ^ "NewsBank for AJC". Nl.newsbank.com. Retrieved January 26, 2013. ^ "Bob Daniels, Chelsea Lumber Owner, Dies at Age 83". Chelsea, MI Patch. Retrieved March 16, 2016. ^ "'The Newsroom's' Jeff Daniels at home on a range of characters". latimes.com. Retrieved March 16, 2016. ^ "Jeff Daniels Play Nommed for ATCA Award; Purple Rose Greenhouse Grows New Plays". Playbill. Retrieved April 10, 2016. ^ "About Jeff Daniels". Jeff Daniels. Retrieved April 10, 2016. ^ Mansfield, Stephanie (April 16, 1985). "Jeff Daniels, Coming Up Roses". Washington Post. ISSN 0190-8286. Retrieved April 22, 2018. ^ Moser, John J. (May 7, 2015). "Interviewing Jeff Daniels of 'Newsroom,' 'Dumb and Dumber': Guitar started as distraction, became 2nd career". The Morning Call. Retrieved April 22, 2018. ^ a b "Detroit: Theater". Arts America. Retrieved March 16, 2016. ^ Largent, Kimberly (February 2003). "An Interview with Jeff Daniels Writer, Director, Actor....and Student of the Civil War". osu.edu. Ohio State University Department of History. Retrieved March 16, 2016. ^ "Speed (1994) – Box Office Mojo". www.boxofficemojo.com. Retrieved March 16, 2016. ^ Ebert, Roger. "Good Night, and Good Luck Movie Review (2005)". www.rogerebert.com. Retrieved March 16, 2016. ^ Staff, Variety. "Satellite Award nominees". Variety. Retrieved March 16, 2016. ^ "Howl, with Jeff Daniels, James Franco, Mary-Louise Parker, Aaron Tveit, et al. to Open Outfest 2010". TheaterMania.com. Retrieved March 16, 2016. ^ "Jeff Daniels Joining 'Divergent' Series in Key Role (Exclusive)′". Retrieved April 28, 2015. ^ a b "Jeff Daniels parties outside". Biography.com. Retrieved July 7, 2016. ^ "Jeff Daniels: March/April 2011 Cover Story". GuitarPlayer.com. Retrieved June 17, 2018. ^ a b "Jeff Daniels' Wife and Children". wagcelebrity.com. Archived from the original on March 2, 2014. Retrieved August 26, 2013. ^ Daniels, Jeff (March 11, 2016). The Late Show with Stephen Colbert. Season 1. Episode 109. Event occurs at 29:35. CBS. For 30 years, I've lived in a little town called Chelsea, Michigan. ^ Lichterman, Joseph (December 20, 2009). "Actor and Michigan native Jeff Daniels challenges graduates to make a difference at Winter Commencement". The Michigan Daily. Retrieved May 19, 2010. Wikimedia Commons has media related to Jeff Daniels.